Disclaimer: we had a bit of a struggle trying to recount all of the information we picked up on this tour. It might be due to the beer consumed prior, during and after the tour. Admittedly, we might have gotten a bit ‘excited tipsy’. For those uninitiated, it’s when you are excited about something and there are drinks at hand. Being in a brewery makes this phenomenon very likeable to happen, and so you consume more than you should and get excited tipsy, which is a tad bit too much if you’re on a mission to write a serious piece. Luckily we are not legit journalists and writing about beer doesn’t always have to be serious. One thing that is seriously good though - beer from Brixton Brewery. Tucked underneath railway arch 547 on Brixton Station Road, you might miss it unless you turn up on Friday or Saturday when the tap room is open. If the sun is out, the amount of people spilling outside on the sidewalk sipping beer will give it away, which serves as a very inciting calling card to anyone passing by. Started in 2013, Brixton Brewery has grown steadily over the years, becoming a local favourite as well as attracting interest from overseas. We say this purely based on amount of times we have been there and seen beer lovers from different parts of the world come in, so evidently the word on good craft beer travels fast. And perhaps this border-less reputation was one of the key factors that lead to the beer giant Heineken acquiring a minority stake in the business, an investment which means expansion and more Brixton bottles and cans in more places for more people to enjoy. But even with expansion on the horizon the business is still staying within the same postcode and celebrating local culture, community and landmarks. Beers are given names linked to local area and if you look closer you’ll find visual cues on the labels that point to all things Brixton. Also, very importantly, all of their beers are vegan friendly. So one Saturday we went on a little tour to get a closer look into the process of brewing. Chris, our guide and also one of the friendly and very knowledgeable brewers, showed us around and broke down the different stages of creating a solid brew. 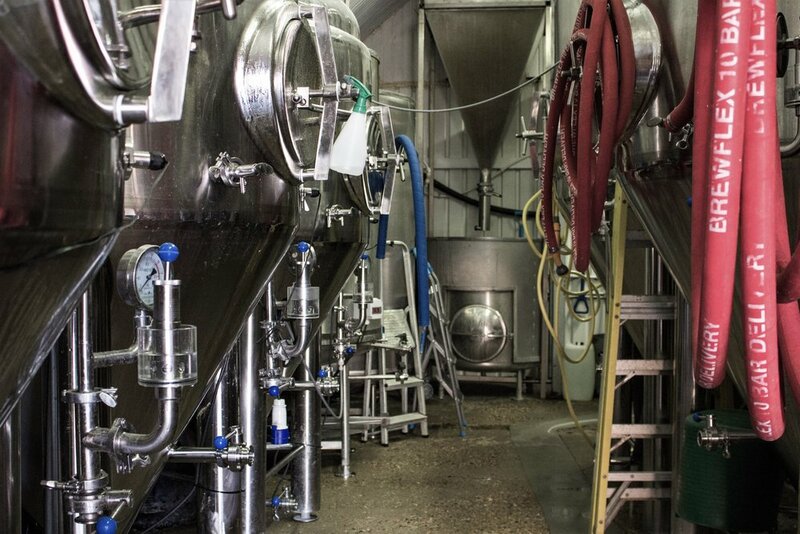 Loving beer doesn’t always translate into actually understanding what goes on behind it and how much hard work and craftsmanship goes into a single pint. It was really insightful and interesting to learn more about it. There’s so much more beyond the most common combination of hops + water + malt + yeast. 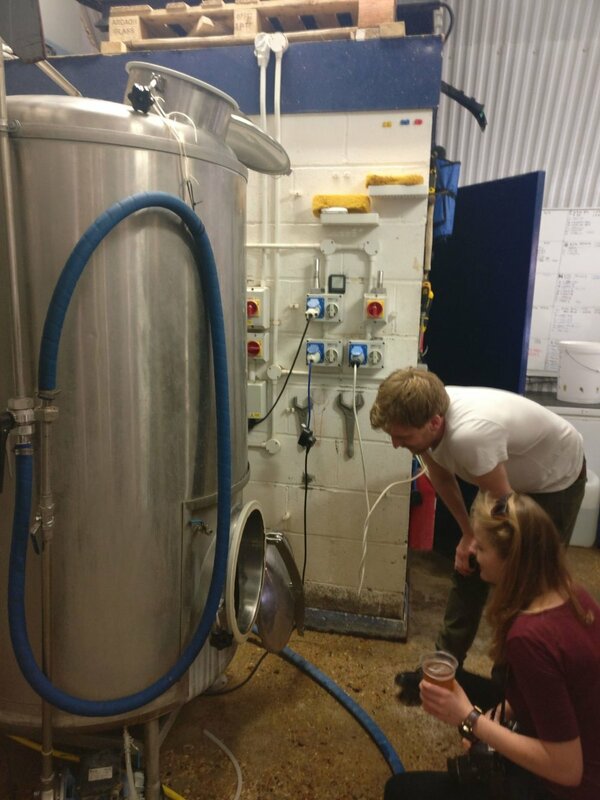 Here’s a few things we remember: there’s this tank that looks like a massive kettle from the outside and holds hundreds of litres. You have to use this tool called hydrometer which gauges the alcohol and sugar levels in the fermentation of the beer. 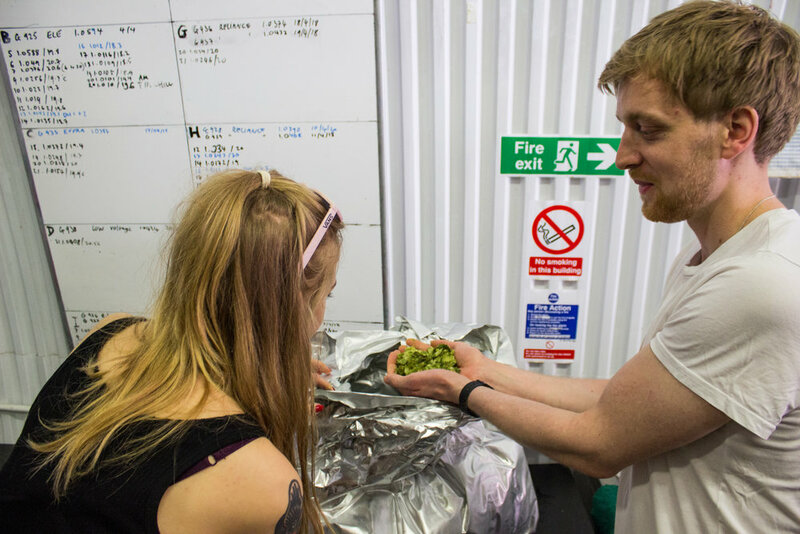 The hops Brixton uses come mainly from USA and Australia and have to be kept in the freezer to retain the freshness. But let’s not give it all away. If you’re interested enough or just curious in what goes on behind the scenes you can catch the tour yourself. They have one kicking off every Saturday afternoon around 12.15pm and guess what: they’re free! 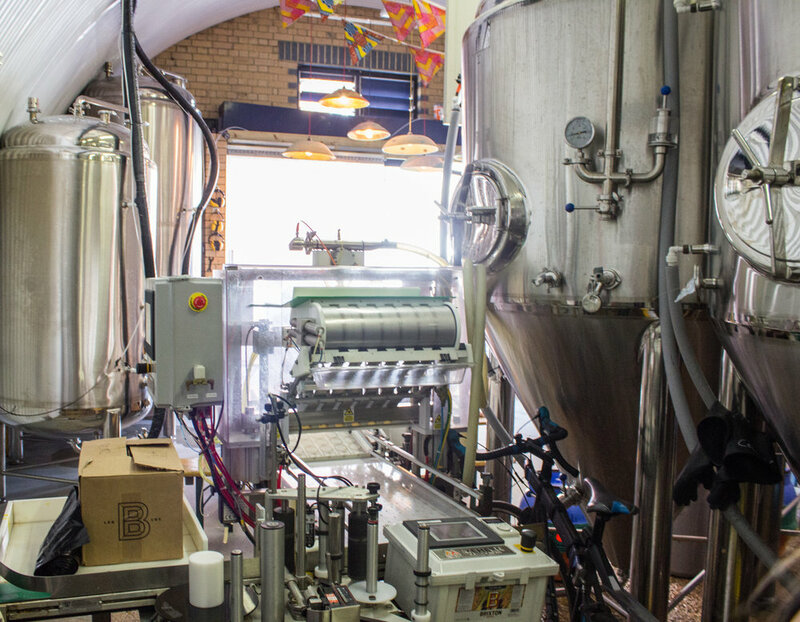 Brixton Brewery is often keeping people on their toes with limited batches and one-off experimental brews. So be aware that if you pick a favourite outside what they call their “core beers”, it might be gone the week after. But you may also stop by a few weeks later and find a new favourite, which adds motivation to visit (as if we ever need motivation to go for a tasty pint). Personal favourites of ours are the Electric I.P.A and Nuclear Dawn Botanical Sour, the latter being one of those limited ones that quickly sold out but lucky for us they had found some leftover stock on the day we were there. The taproom is open every Friday (only during Spring & Summer time) 6-10pm and Saturday 12-6pm. 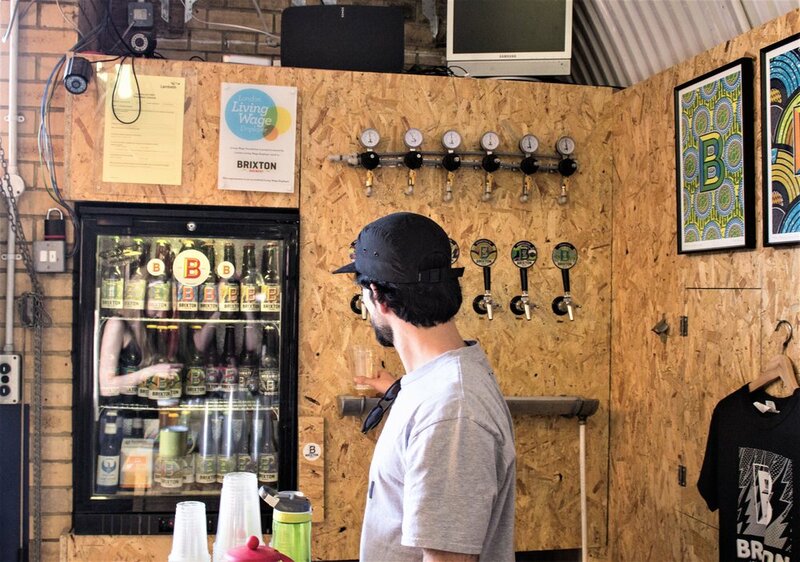 It’s a less than a 5 minute walk from the tube station and the vibe is welcoming and relaxed, a great alternative if you need a break from the noisy pubs or the vibrant market streets nearby. Beer gardens are overrated anyway. 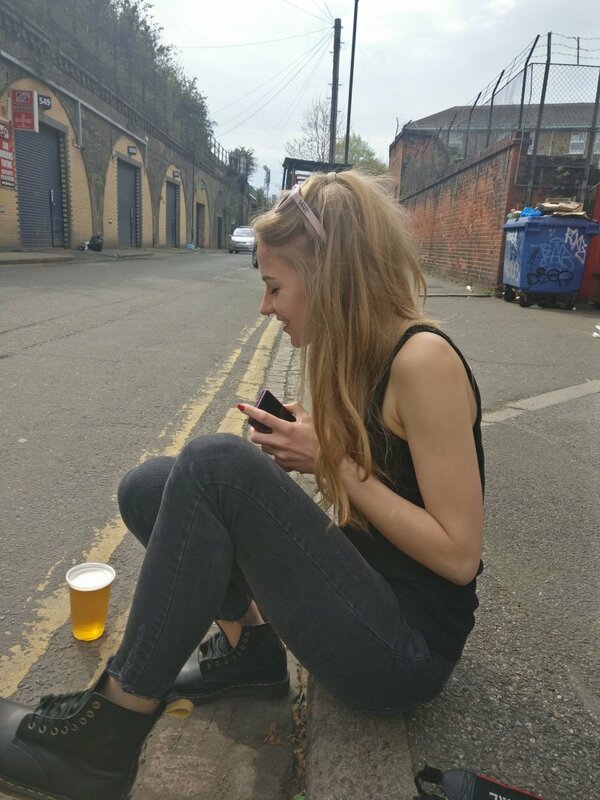 All you really need is a taproom with quality brew, some benches or the good old pavement to sit on. And some sunshine, preferably.